A former Wake County Public Schools elementary teacher has been charged with taking indecent liberties with a child. Jeffrey Mohr, age 27, was arrested and charged with one count of felony indecent liberties with a child. 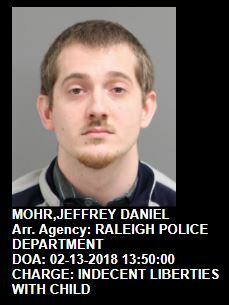 According to the arrest warrant Mohr “unlawfully, willfully and feloniously” committed “a lewd and lascivious act upon the body of a child who was under the age of 16.” The warrant also indicates that the child in question is not a student at Smith Elementary where Mohr taught 4th grade. Mohr resigned one day before his arrest on February 12 and had taught at the school since April 2016. According to a state law passed last year, teachers are supposed to give a 30-day notice before resigning. The law states that if the resignation is tied to an arrest or criminal activity, the state board of education must be notified. The school’s principal, Kim Mitchell, issued a statement in an email to parents. “While privacy laws prevent me from providing much information about the situation, I can share with you that the incident under investigation did not involve a student at our school and it did not occur on our campus. The teacher is no longer employed by the Wake County Public School System,” said Mitchell in the statement. This entry was posted in CRIME, EDUCATION, LL1885, Quiet Epidemic and tagged Jeffrey Mohr, Quiet Epidemic, Wake County Public Schools. Bookmark the permalink. Mr. Mohr’s court date is currently set for March 7th, Room 301, AM session.